Prospective buyers of a new weather station are sometimes concerned as to how easy the process of setting it up might be. The Davis Vantage family of stations is indeed straightforward to set up and requires no specialist knowledge. The installation steps are set out below. As with so many things in life, a little planning can help make the actual installation process run much smoother. Consider initially for example whether a wireless or cabled station might be more suitable for your needs and which – if any – installation accessories might be helpful. The wireless vs cabled choice is dealt with in summary and the wireless option considered in more detail elsewhere. Basically, wireless stations offer convenience of installation, but only limited (100 – 150m) reliable line-of-sight range without using wireless repeaters. Cabled models are cheaper, but obviously require a run of cable to be installed. 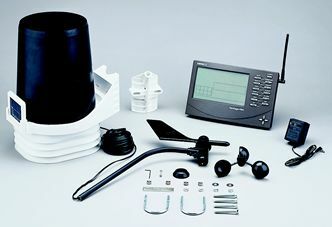 Do review our recommendations as to preferred siting positions for the main sensor unit (called the ‘ISS’, which has the large black cone of the rain gauge on top and can be seen in the top left of the picture below) and anemometer (for wind speed and direction), remembering that the main sensors are ideally sited in an open area about four feet above ground level, while the anemometer performs best mounted higher up, eg above roof level. (Though these are suggestions only and won’t necessarily be relevant or possible with every installation.) In all standard VP2 stations (both cabled and wireless), the anemometer is attached to the ISS unit by a 12m cable, which can be extended in accordance with the cabling comments above. For wireless stations, a separate anemometer transmitter unit is available as an option and offers complete independence of mounting of anemometer and ISS – this can be a major convenience in some installations. Besides possible extension cables, you will want to think about what the main sensor unit (ISS) and anemometer will be fixed to. As this picture of the supplied system parts for a VP2 station shows, the station does come complete with both U-bolts for attaching to any circular mast of 32-44mm diameter or with strong screws for fixing to any flat ‘screwable’ surface. The ISS unit is firmly secured with a single U-bolt, as is the anemometer. While any suitable mounting points can of course be used, for the ISS we would suggest a 4″ square fence post set firmly and vertically in the ground with concrete. (This should preferably be in an area of natural ground, including grass, but not over a paved or asphalt area which will distort temperature readings). The Davis Mounting Tripod (part 7716) makes an excellent alternative to a wooden post for fixing the ISS unit but do remember that each of the three tripod feet needs to be firmly fixed to the ground, with the central mast good and vertical. The anemometer (for measuring wind speed and direction) is the one item on the station that often requires special attention for mounting. While the anemometer will measure wind strength accurately at whatever height it’s mounted, it is a fact that close to ground level wind strength drops considerably. Therefore for official weather observations, there is a convention that the anemometer should be mounted high up so as best to catch the wind. Unless you’re fortunate enough to have a large open area where a special mast can be erected, in practice this often means mounting the anemometer at roof level. Ideally, it should be 2-3m above the highest point of the roof to avoid wind swirling around the roof itself, but this isn’t always possible and the principle is simply the higher the better. Often there may be an existing TV aerial mast to which the anemometer may be attached (it’s a relatively light item), but otherwise it may be worth considering getting a local TV aerial installer to put up a separate pole (of 32-44mm diameter) for the anemometer. We specifically don’t recommend placing the anemometer in such an awkward position that it becomes a major problem to reach it for maintenance purposes. We recommend that you set up the complete station indoors for test/familiarisation purposes before fixing the outside sensors in their final position. All that remains to set up the station indoors is to connect up any remaining sensor cables as per instructions in the manuals and finally to apply power to the console, either via the supplied mains adapter or batteries. The first time that a console is powered up it will automatically enter its ‘Setup Mode’. This is described in detail on p19 of the ‘VP console Manual’. It is important that you follow carefully the dozen or so steps that are each described in detail in the manual. It’s well worth setting aside some time (say 15-20 minutes) to run through the simple process step by step. The console will ask you for your height above sea level and latitude and longitude during the setup procedure, so it’s best if you find out these figures beforehand. (if you don’t have a satnav unit, lat/long can be found, for example (there are several such sites including the Ordnance Survey site, from the website www.streetmap.co.uk, entering your postcode and then clicking the link to request coordinates.) Don’t worry if you haven’t got exact figures – these can always be amended at a later time. Once the setup procedure is complete, a final longer press on the Done key should start the station reading. Don’t be concerned if not all readings appear immediately – one or two values such as humidity do take a significant time before the first reading appears. Of course, indoors, the wind speed will be zero, but the cups can be carefully given a quick spin by hand when a speed reading should appear on the console after a couple of seconds. For wireless stations it’s now worth moving the console and ISS to their planned positions and checking that wireless reception is satisfactory (see p50 of the Console Manual and also the Prodata handbook). If reception is not ideal (95-98% is often the maximum attainable value for various technical reasons) then experiment with different console and ISS positions and aerial orientations until you’ve found the best combination. A reception of 60-70% should be adequate, though obviously the higher the better. Finally, proceed with fixing the outside sensors in your chosen locations.